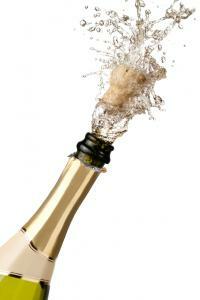 People love to celebrate special occasions by popping the cork on a bottle of champagne now and again. Unfortunately for a plane full of passengers flying from the UK to Turkey recently, it might not make sense at 30,000 feet. As the story goes, everything was going along just fine when a couple of passengers decided to order champagne. Unfortunately for everyone else on the plane, when the flight attendant loosened the cork, it popped out and hit the ceiling. Apparently the explosive sound then caused all the oxygen masks to drop from the ceiling. That in turn caused lights to flash in front of the Captain, who immediately invoked security procedures and do an emergency landing in Milan. Once on the ground, the all clear was sounded, but the masks had to be put away and some testing had to take place. Eventually, about 7 hours later than expected, travelers arrived at their destination. We bring up this champagne story to illustrate the surprising domino effect a series of events can have when they become linked together. It reminds us of the financial volatility we are seeing from overseas markets that include Europe, Japan and China and their potential impact on the US. Consider that this is now a globally linked financial work, so when different countries and/or major trading partners have issues, these problems can link back to us. Our largest banks do lots of business with similar entities operating overseas. Further, many global banks have significant subsidiaries in the US. In fact, so many large banks have operations here that Fed research finds (depending on the definition of foreign banks operating here) these entities control close to 20% of our entire banking market. Perhaps even more important when measuring the potential global impact of a financial issue would be to look simply at the Top 10 banks by asset size. Here we find that as of the end of last year, this group controlled about $26.3T in assets. By country, however, China was the largest at 53%, followed by France (18%), the UK (10%); the US (10%) and Japan (9%). Meanwhile by count, China had 5 banks, France had 2 and everyone else on the list had only 1 (the US was JPMorgan). Of course you can argue that assets don't really mean much, but when things go bad, we all know the exposures you have in a leveraged industry can quickly follow suit so it is at least worthy of pointing out. What about the Greece issue? Consider that the global banking system was in a very weak position in 2008 at the height of Greek problems. Global banks had a $300B exposure to the country at that point, but 7Ys later it is down to $54B. While exposure is down, a collapse of the Greek banking system would be quite painful because banks in other countries linked to Greece remain vulnerable and no one wants to see any dominoes start to fall. What about China? Here, a recent BIS report finds Chinese banks saw net capital outflows of $109B in Q1 alone. This was mostly as a result of Yuan denominated deposits shifting out of Chinese banks and into non-Chinese banks. As every banker knows this reduces liquidity and adds to the pressure on the currency, but it also makes sense when you consider the recent Yuan devaluation. To be sure, this isn't a game breaker for the banking world, but it does add incremental pressure. As the passengers on that flight found out, there is a right time and a wrong time to pop the cork on a champagne bottle and celebrate. Maybe the financial turmoil is one reason many of the community bankers we know are still keeping their bottles on ice as they continue to grind through a difficult operating environment. Yields declined 7bps pressured by falling commodity prices and the sell-off in equity markets. Multi bank holding company Pinnacle Bancorp Inc. ($8.5B, NE) will acquire Woodhaven National Bank ($461mm, TX) for an undisclosed sum. Great Southern Bank ($4.1B, MO) said it will consolidate 16 branches into other locations. A quick read of recent FDIC consent orders against a variety of banks finds civil money penalties for flood insurance violations (multiple); unfair and deceptive disclosure and implementation of deposit reconciliation procedures; and weaknesses in BSA compliance (multiple). Interactive Teller Machines (ITMs) reportedly cost 40% less than using tellers and can also do about 95% of the functions that a teller performs. NCR estimates it costs banks about $2 for each ITM transaction vs. $4 for a traditional teller transaction and $1.25 for a traditional ATM transaction. ITM machines cost $50k to $80k each. Fox reports 17% of Harvard Business School graduates went into the technology field vs. 7% in 2007. An American Express survey of small business owners finds: 93% say they are confident they can get the funding they need to grow their business; 72% are making growth a priority; 65% have created a formal plan for growing their business; 63% are going slow when it comes to expanding; 49% say generating ideas for growing their business keeps them up at night and 36% say they worry about cash flow issues. Research by Zolt finds 42% of business travelers say they have 1 or 2 electronic devices and 43% have 3 to 4 devices. Most people said they carry a smartphone (84%), laptop (70%) and tablets (37%). Zolt research finds 41% of business travelers are between the ages of 21 to 29 years old.